This is one of the most common plumbing problems we get emergency calls about. We understand—it’s alarming to have a toilet suddenly start spilling water onto a bathroom floor with no signs of stopping! We have good news for you! An overflowing toilet doesn’t have to be a major disaster for your home. First of all, we can fix it—and we provide same-day service so you won’t have to go with an unusable bathroom for long. We know how important this room is to your household’s daily life, and we’ll be there fast to have the toilet fixed. Second, if you take the right steps, you can prevent further problems from the overflowing toilet and stop water damage. Below are guidelines for what to do when you encounter this sudden plumbing trouble. Nobody wants to have to deal with putting in a new central heating system in the middle of winter, but if your old heater has to go, or you’re in a new house that hasn’t had its first installation yet, then you don’t have much choice. But as long as you rely on professional HVAC service in Lansdale, PA, there’s no reason the replacement/installation shouldn’t go fast and end up delivering you the exact right heater for your needs. And a big part of doing the job right is accurately sizing the new heating system. Summer is not too far off, now. That means that you need to start getting your home ready for the coming hot months. You’re probably going to be using your air conditioner a fair amount this summer, which means that now is the time to make sure it’s ready for the extra demand. The best way to do that is to make sure to schedule preventive air conditioning maintenance. Read on to find out why air conditioning maintenance is so important, and why spring is the ideal time for it. Want to Destroy Your Heating System? Follow These Awful Tips! Normally, we post here about all the things that you should be doing to keep your home systems in top condition. This time, though, we figured we’d take a slightly different route. We’re going to be using this week to go over some of the best ways to completely ruin your heating system in a short amount of time. In case this isn’t already obvious, you should absolutely not follow any of the tips below! In-fact, you should do the opposite. But, in the interests of having some fun and changing things up, here are some great tips for destroying your heater. Posted in Heating | Comments Off on Want to Destroy Your Heating System? Follow These Awful Tips! 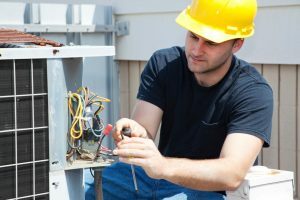 We are officially in summer, and while you may be thinking that you’ll just wait to schedule maintenance for your AC until after the season, keep in mind that it is never too late do so. While there may be better times than others to schedule maintenance for your air conditioning system, the bottom line is that it really is a necessary service, so do it when you can do it. The experts at Carney Plumbing Heating & Cooling are here to help with all of your air conditioning needs, so call us today and schedule a maintenance appointment for your AC in Lansdale, PA.
Can a Ductless AC Really Provide Whole Home Cooling? With so many choices for whole home air conditioning, it can be hard to know which system is the best fit for your home. You may also have concerns that systems like a ductless air conditioner may not have the power to fully cool your home as needed. This simply isn’t true. When you choose to install and use a ductless AC in your Lansdale, PA, home, you can rest assured that it can more than handle your cooling needs. Why? Let’s take a look. Posted in Air Conditioning | Comments Off on Can a Ductless AC Really Provide Whole Home Cooling? Eventually, you will need to call a professional to schedule new water heater installation if your unit is broken down completely and will not provide any hot water to your home. This can come as a surprise right in the middle of a shower or before you’ve completed a large load of laundry. Instead of waiting for your water heater to fail entirely, you may decide that it makes more sense to schedule replacement around the end of your unit’s lifespan. Look out for the signs that your water heater may need replacement sooner rather than later. Leaks: Technicians can repair many leaks on the spot. Sometimes, a technician simply needs to make some adjustments to the temperature, flush the tank, or replace the temperature and pressure valve. However, when the leak comes directly from the tank, there may be no saving your unit, and a sudden flood is a definite possibility. Rust: One of the reasons that water heaters leak is when rust and corrosion wear away the steel tank. Your tank is protected from corrosion via the sacrificial anode rod, and with proper maintenance this should not happen before your unit has outlived its expected age range. However, if your tank does begin to corrode, it will require replacement. This may be indicated by leaks in the tank or discoloration in the water when you turn on a hot water tap. Poor Performance: If your water heater just does not seem to be working the way you would like it to, it could be a sign that your system is approaching the end of its life. Many people inherit their water heaters when they purchase their homes and may be unsure of how old the unit is. Poor performance is a good indication of impending failure, although it could also point to a number of other problems, from a broken dip tube to sediment buildup. Old Age: If you know how long you’ve had your unit, you may simply decide to replace it now before it gives out someday soon. Most storage tank water heaters go about 10-15 years before they can no longer run effectively or efficiently. A new water heater may offer better performance and save you some money over time. Carney Plumbing Heating & Cooling has been dedicated to quality customer service for over 30 years. For water heater installation in Lansdale, give us a call! How Do Storage Tank Water Heaters Work? As water flows from the water main to your home through a series of pipes, it’s usually much cooler than what you’d expect from a hot shower. The water heater, then, is an important asset to your home which is vital for many everyday activities around the home. And while there are a few different types of units available today, the storage tank water heater remains the most common type of unit used in homes. Yet many homeowners are unsure of how these systems heat water. Why is the tank so large? How does hot water enter the faucet? To answer these questions, we’ve put together this short guide to hot water heaters. 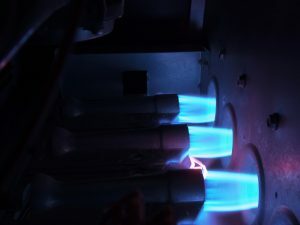 There are two types of systems that use different heating elements to heat the water: gas and electric. While these systems may look large and complex, they actually rely on a natural process of heat exchange in order to keep water heated. First, cold water enters the tank through a large pipe that leads all the way to the bottom. Here there may be a burner located underneath the tank, or an electric heating element may be located toward the bottom. Here’s where science takes over; hot water naturally rises above the cooler denser water. Another small pipe is located towards the top of the tank. This pipe picks up the heated water and carries it to the faucet. Water continues to re-enter the tank in order to keep a large supply of hot water on hand. A few more key elements of hot water heaters help keep everything in working order. For example, a thermostat helps monitor the temperature while a pressure valve keeps the water pressure at a safe level. One problem you’ll want to avoid at all costs is rust, but the anode rod can prevent rust from damaging your system, increasing its lifespan. When rust damages the storage tank of your unit, you’ll likely need to replace your water heater. The anode rod attracts corrosive elements that may cause your unit to rust through, so it’s important to replace this rod when it becomes too worn down. If you’re not sure whether you want a gas or electric water heater, or if you want to talk to an expert about hot water heaters in Lansdale, call the experts at Carney Plumbing Heating & Cooling today! Posted in Water Heaters | Comments Off on How Do Storage Tank Water Heaters Work? Perhaps the most important part of your home’s plumbing is the water line. Your plumbing system is all about moving water from one place to another, but without the water line from the municipal supply you wouldn’t have any water in your plumbing at all. Water lines are durable and should last for many decades. But sometimes they can wear down, corrode (especially for pipes made from older galvanized steel instead of copper), suffer damage, or have tree roots infiltrate and block them. Repairs can sometimes restore the water line, but there are situations when you should have the line replaced in whole or part. Below are some of the signs to look for that it’s time to consider water line replacement in Lansdale, PA. Call the dependable staff at Carney Plumbing Heating & Cooling when you need the work done; we can take care of it fast, and we’ll provide a free estimate for the replacement. Drop in water pressure: If the water pressure coming from all taps and fixtures shows a decline that you cannot explain, it may be due to a water line that is blocked or leaking. Make sure that it is not a municipal problem (see if a neighbor is encountering similar difficulties) and then call for plumbers to investigate. Discolored water: When a water line starts to corrode, it will change the color of the water from the taps to a rusty-brown, similar to what you might see when turning on a tap after a few weeks. This could also come from a municipal supply issue, but have a professional plumber look into it to see if the water line is at fault. Water coming up through the yard or sidewalk: Should a section of the water line break, a large amount of water will start to rise to the surface. This will result in damp areas and pools on your yard that don’t come from rain or sprinklers. Sometimes the water will start rising up through the sidewalk. Don’t hesitate when you see this evidence for a severely damaged water line: call for plumbing help immediately. Carney Plumbing Heating & Cooling offers same-day service for your plumbing needs. When you require water line replacement in Lansdale, PA, make us your first call. We are fully licensed, insured, and bonded, and we perform line replacement in accordance with the PA-adopted International Residential Code. The lifespan of your air conditioner is approximately 10-12 years; past the 12-year point, you may start to see a serious decline in your energy efficiency, which can result in a serious incline of your energy bills. In addition to the age, any air conditioner older than 8 years was purchased when the minimum required SEER number was 10; this changed to 13 in 2006. Odds are, if you purchased more than 8 years ago, you may have an AC that is operating at a lower SEER number than is energy efficient. It is estimated that each SEER point you go up can save you up to 5% in annual energy costs – something to review carefully in regard to your current AC. As a mechanical and electrical appliance, it is expected that you will need to make repairs to your air conditioner at some point. But if the amount of needed repairs is becoming excessive and costly, it may be time to consider replacing. Why? Repairs can add up quickly, and you may find that what you’ve spent on repairs is equal to, or greater, than the cost of a new system. Hot and cold spots can be an indicator that your aging system simply cannot keep up with the cooling needs of your home. Pushing your air conditioner to cool more by lowering the thermostat only puts more stress on your system, and raising the thermostat can increase your discomfort. If there are no existing mechanical problems and your AC still can’t cool as it should, it may be time to look for a replacement. As we mentioned above, making the decision to install a new air conditioner is a big one, and professional help can go a long way toward ensuring you purchase an AC that truly fits your needs. Call Carney Plumbing, Heating & Cooling today and schedule an appointment to discuss your air conditioning system replacement in Lansdale. Posted in Home Maintenance | Comments Off on Should I Repair or Replace My Air Conditioner?